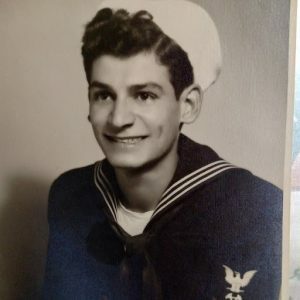 FULTON, NY – James Arcadi, 95, of Fulton, NY, passed away peacefully at the Syracuse VA Medical Center on Friday March 22, 2019. Jim was born in Fulton to the late Ilario and Rose (Christopher) Arcadi. He has remained a life-time resident of Fulton. He was a U.S. World War II veteran having served in the Navy from 1942-1945. Jim was a millwright machinist at Dilts and Black Clawson in Fulton, retiring after 41 years of service. He was a past communicant of Our Lady of Perpetual Help, Minetto, and Holy Family Church, Fulton. Jim loved playing cards and taught all of his grandchildren how to play Cribbage. He enjoyed hunting and fishing well into his eighties; as well as, his 3 p.m. beer and shot of ginger brandy for medicinal purposes. Jim was a man who was always willing to lend a helping hand to his friends and family. He was predeceased by his wife of 60 years, Mary (Marturano) Arcadi, in 2008; and their daughter, Karen Arcadi Osborne, in 1974; and his four brothers and one sister. Mr. Arcadi is survived by his children: Theresa (George Roberts) Coppage of Clay, James L. Arcadi of Florida and Sandra (Daniel) Attwood of Oswego; seven grandchildren: Andrew, Rachel, Sarah, Christina, Lacey, Jordan and Austin; two great-granddaughters; and many nieces and nephews. Funeral service will be held 10:30 a.m. Tuesday in the Sugar Funeral Home, Inc., 224 W. Second St. S., Fulton, with Rev. Guy Baccaro officiating. Calling hours will be conducted 4 to 6 p.m. Monday at the Sugar Funeral Home, Inc., Fulton. In lieu of flowers, donations may be made in memory of James Arcadi to the Syracuse VA Recreation Therapy Dept. 800 Irving Ave., Syracuse NY 13210. Deepest regrets and condolences to Jim’s family. He was a fine, fine man. Now he rejoins Mary. 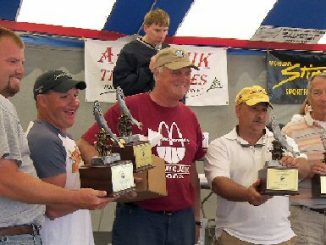 Jim was a strong, well-respected man with a heart of gold. R.I.P sir. Jim was like another uncle to me. He and my Dad were best friends since they were kids. I miss him already. My deepest sympathy to the Arcadi family. I’m sure he is happy to be reunited with Mary and Karen.